Swipes Update # 2. Talk with your team. Share news and ideas. Start discussions. Talk with your team. Share news and ideas. Start discussions. Zdrasty! Hello! We are back in Europe! And it's hot in here, more than California hot! But we're staying strong and keeping the productivity high with cool (non-alchoholic ;) ) beverages. As a result, in the last two weeks, we moved into a new place, did a workation (work-vacation) camp in the woods of Bulgaria and created a whole new way of talking with the team in the Workspace. 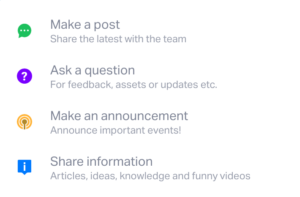 With the new update of the app, you can run discussions, share ideas and talk with your team in a very easy way. We created this because our previous communication part wasn't lively enough. It was easy to share an update on a goal but it was hard to reply to things and pretty much impossible to have a full conversation with the team. Ugh! That sucked! Thus, we reworked the whole discussion section from the ground up. Now it’s easy to have a whole conversation around a milestone, a goal or even a note. Or maybe you just want to share the trailer for the new season of your favorite tv series with the team (you know which one I’m talking about). You can also do that. It's amazing! But let me show you. Starting a discussion with your teammates is easy! If you want to arrange a lunch with your team, it’s that easy - post a question in the "Discuss" menu and see the answers roll in! But where the new communication system really shines is when you're referencing to milestones, goals or notes. You can start a discussion from any place and the Workspace will pull out the right context. Let’s say you are in a note preparing helpful materials for your colleagues so they can start working on the goal. At one moment you probably want to tell them that you are ready or even better - ask them for feedback and if they need something more. You can see that you are starting the discussion just by clicking the "Discuss" button right there in the note. But something else happens as well. Your post gets the context - in that case, the note, attached to it. People can see it, open it and quickly catch up. They will never wonder what this discussion is about, as it often happens in chains of chat and email. See all discussions on a goal, note etc. Maybe you noticed that next to the big "Discuss" button there is a number. This number represents the related discussions to this piece of information. You can click on it and you will see only the posts related to that context. We are very excited about this feature because as time passes by and new topical discussions are started, it becomes very hard to go back in time and see why certain decisions were taken on a previous goal, note etc. Now such information is just a click away! In this way when you see a post and you'll be in the right mindset for it before even reading it - Is a company announcement, an important question or just a FYI. It’s very easy to scan while you are scrolling through the feed and you can read only the things important to you now. 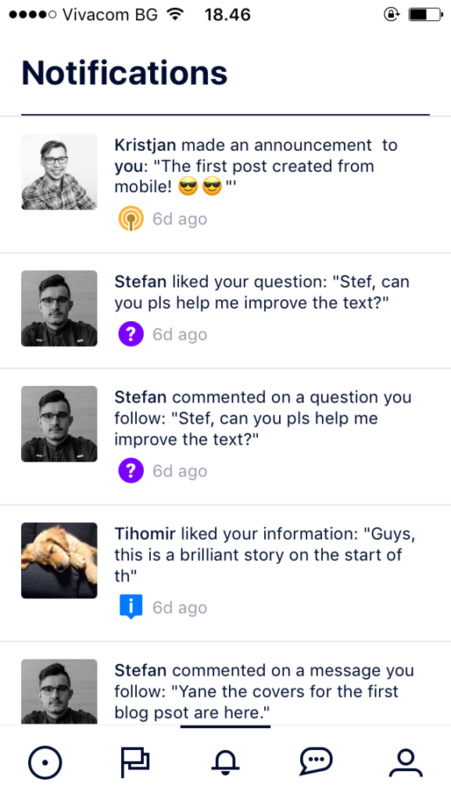 Last but not least, we believe that the new discussion system in the Swipes Workspace will bring the team closer together. It will make people's progress visible and engage everyone into sharing new ideas. It will promote true transparency and a culture of appreciation! The very things that we stand for! The team will feel like one again pushing in the same direction with the same mission. Communication will be more clear, easy to find and very deeply integrated with the rest of your work. Your digital workspace will feel alive but peaceful! Discussions are also up and running on mobile so you can stay connected with the team when you're on the go, take part in discussions and move work forward. NB! To get the update on iOS, go to the Test Flight app on your phone and update the Workspace from there. To get the update on Android, go to the Play Store app on your phone and update the Workspace from there. We are super excited about this change! Hope you are too! We really want to hear your feedback. Go ahead and try it with your team, write to us the things you like about and spare us what you don't. Just kidding - storm us with any feedback. ;) See you next week!